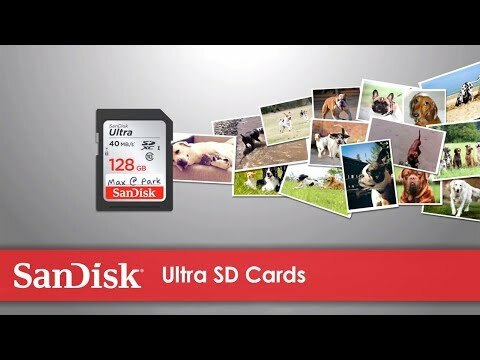 SanDisk Ultra SD cards deliver the speed and exceptional video recording performance to enable you to capture your memories when they happen. Capture amazing quality pictures and Full-HD2 video with your compact point-and-shoot camera. Delivers 32GB to 128GB1 of storage so you can shoot tons of photos and hours of Full-HD4 video (1080p) without changing the card. SanDisk Ultra SDHC and SDXC UHS-I cards4 are durability tested to protect your memories from life’s mishaps—waterproof, shockproof, x-ray proof, and temperature-proof. may be lower depending on host device. 1MB=1,000,000 bytes. 32GB-128GB: Video Speed Class 10 (V10), sustained video capture rate of 10MB/s, designates a performance option designed to support real-time video recording with UHS enabled host devices. See www.sdcard.org/consumers/speed.